Note! The IBeam Active for Nylon String Guitars has a notch in the pickup to accommodate the center brace found on most nylon string guitars. 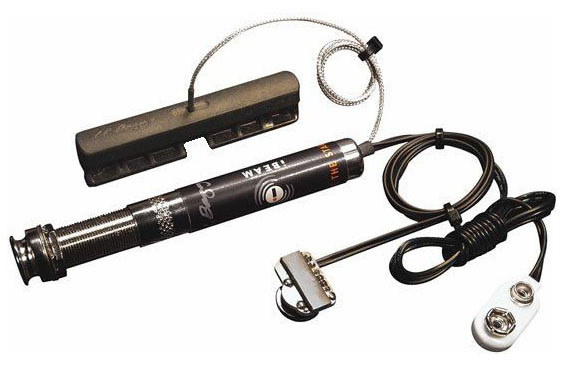 The IBeam Active System includes the IBeam Under-Bridge Transducer Pickup, the Strapjack Active Preamp, a Battery Holder, and the Installation Jig, as well as wire clips. Winner of the M.I.P.A. 's "best pickup" award for 2002 and 2003, the IBeam™ bridge plate transducer features fidelity and sensitivity comparable to top-quality studio microphones at a significantly lower price. It has quickly become a top choice for professionals (especially soloists and players in small ensembles) who require studio-level fidelity on stage. The IBeam Active System combines a patented bridge plate transducer with an all-discrete class A endpin preamp that enables you to simply "plug-in-and-play". The user-installable IBeam reproduces the natural tone of an acoustic guitar while maintaining perfect string balance and providing full dynamic range. The IBeam itself is the heart of the system and weighs only 1/3rd oz. This revolutionary bridge plate transducer easily sticks to the bridge plate on the inside of the guitar and does not affect the acoustic tone of the guitar in any way. The IBeam is microphonic enough to hear the rich (but correct) texture of finger squeak and top tapping, but is resistant to feedback and gives you excellent amplified sound without a hint of piezo quack. Included with each IBeam is a placement jig that allows you to install the pickup in minutes and get the ideal placement for the transducer inside the guitar. The IBeam preamp is made up of class A discrete circuitry and built on the stereo Strapjack Plus. Pre-tuned to deliver that great L.R. Baggs performance from the IBeam in any situation, it is ultra-quiet and faithfully amplifies the sound and dynamics of the IBeam. There is even a second passive channel available if you would like to add a magnetic or undersaddle pickup to compliment the IBeam. This system provides studio-quality fidelity for the most natural acoustic tone available from a pickup. The entire system is ultra light (1/3 oz) and will not alter the acoustic response of the guitar. Quick and easy installation: minimal alteration to guitar, jig included to help with pickup placement (note: jig works on pin bridge guitars only). One size fits all: No more worry about saddle slot sizes or altering the saddle. Action and acoustic sound remain unchanged. Installation of the IBeam pickup requires no drilling, as it mounts in the guitar under the bridge. An installation jig is included to align the IBeam in the correct position. The Strapjack Plus (which includes the active preamp) requires a 1/2" hole where your existing strap button is on the base of the guitar (note that some guitars are pre-drilled to accept a 1/2" strap jack). The volume control mounts under the edge of the soundhole with special double-side tape (included) and requires no drilling. The pickup sensor is 2 7/8" L x 7/16" W x 5/8" H.